‘High performance homes’ is a term that’s tossed around a lot. We find that there is a lot of variation on exactly what it means or the benefits of owning a high performance home. Here is a very basic primer on what a high performance home is. You can be sure with investments and innovation the definition will continue to evolve. Sopris Homes was one of the very first high-performance home builders in all Colorado and we’ve got years of experience designing and building high performance homes. Let’s look at a few things we like to think of when we consider a high performance home. From this definition, it’s clear that a high performance home will not just be energy efficient, but will also incorporate much wider sustainability, durability, safety and cost-in-use features. If you’re not a technical expert, this is a lot to consider when designing and building your new performance home in Colorado. A core element of a high performance home is energy efficiency. Building a home with a great thermal performance is a no-brainer. You get a more comfortable home, low energy bills and help tackle climate change. There’s no reason not to do it. Residential energy use accounts for around 21 percent of total energy consumption in the U.S. in 2017. By building beyond building code standards we can create warm, toasty homes that don’t tax your children’s earth to run. We focus first on creating an insulated, air-tight building envelope. Then we look to spec high-efficiency heating and cooling systems and incorporate renewable technologies where possible. When speaking about energy efficiency and new technologies, solar roofing tiles come to mind. In a 2017 project Sopris Homes implemented CertainTeed Apollo II roofing tiles that were (1) the first Zero Energy project in Colorado to use this new solar roofing tile, (2) the largest residential solar shingle project in Colorado, (3) the first solar shingle project on a concrete tile roof, and (4) the first solar shingle project on a net zero home project. Being innovative and taking bold steps towards high performance building is nothing new to Sopris. When we think of air pollution, we don’t really consider it in the context of our homes. But a growing body of scientific evidence indicates that the air inside buildings can be more seriously polluted than the outdoor air especially near populated areas. Its important to specify a high-performance ventilation system to prevent the build-up of indoor pollutants. Our homes are also built using materials, paints, and sealants with a low VOC (Volatile Organic Compound) content. Remember, form follows function so a high performance home shouldn’t just look good; it should feel good first and foremost. We want your home to last not just one lifetime, but several lifetimes. Durability is a factor in every decision we take on materials, finishes and construction methods for a project. We seek out more resilient alternatives to traditional products, like wood sidings or rock that may look natural but but is more durable and requires less maintenance. It’s important to consider the whole-life cost of products when setting your budget for your home. Using durable products may mean a slightly higher up-front cost, but better value over the long term. Consideration of technology in home design used to be just about making sure there were enough power and communication outlets. But all this has changed. With the growth of ‘smart’ home technologies, our heating and cooling systems, appliances, entertainment and security systems can be linked together and controlled from a simple phone app. So you can interact with your home even when you’re on the move. Environmental performance is not just about reducing the energy consumption of the home. Taking a whole life cycle approach means you look at all the environmental impacts relating to the construction and use of your home. So what does this mean? Well, it means looking at the materials that go into constructing the home, and how they’re produced and disposed of. It means thinking about how the building will need to perform not just now but ten, twenty or even fifty years into the future. For example, there are various different types of cladding and siding you could use. A whole life cycle approach considers the durability of these materials and maintenance costs to determine which material is the best value over the lifetime of the home. Though not part of the formal definition, in our eyes a high performance home must be aesthetically pleasing. Your home doesn’t need to be a contemporary, modern design (though many high performance homes are). Depending on your location, a classic design may fit in better with your surroundings. The key to designing your perfect home is making sure it meets both your present and future needs. We incorporate design elements such as flexible living areas, linked indoor/outdoor spaces and smart home workstations to make sure your home can adapt as your life changes and integrates new technologies. All a bit too much detail to think about? 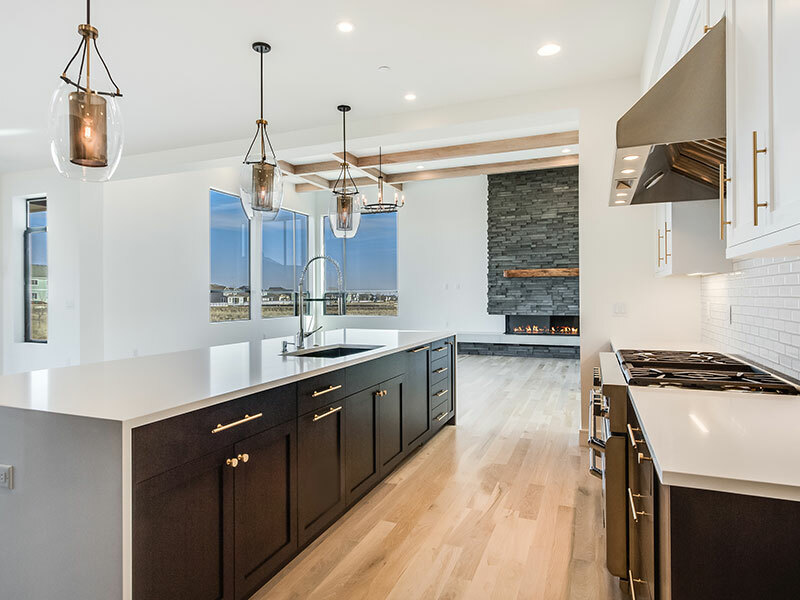 If you’re looking for a Colorado Home Builder who specializes in designing and building custom high performance homes, get in touch with Sopris Homes today to learn more.